On Wednesday, David Warner proved there’s nothing he can’t do with the bat in his hand. Representing Sylhet Sixers in a Bangladesh Premier League (BPL) fixture against Rangpur Riders, the Australian batsman smashed an unbeaten 61 off just 36 balls that included two sixes. 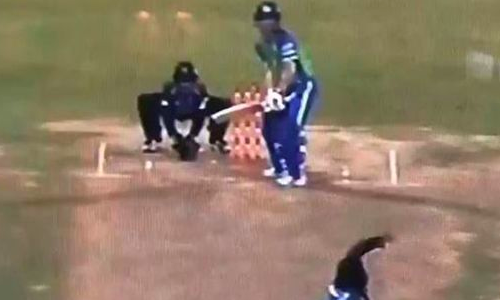 However, one of them, that he hit off off-spinner Chris Gayle, was perhaps something you wouldn’t have seen before. After failing to work a quicker delivery on the leg side, Warner – a lefty – turned into a right-handed batsman to face the next ball. And guess what? He unleashed a clean strike, straight over the bowler’s head and over the ropes. Wow! Warner completed his fifty by the virtue of the shot s Sylhet went on to register 187-5 in 20 overs. In reply, Rangpur could only manage 160-6. He would later reveal the secret behind his ambidextrous prowess. “It’s one of those things at the back of my mind, I couldn’t get Chris away,” he said.